Hi, long time no see! I've been busy with my documentary series, "Memories: beyond the game" (www.youtube.com/playlist?list=… but here I am again with some new Real Bits. 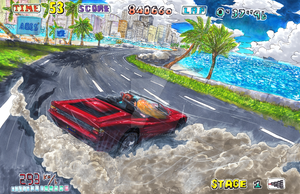 This time, the classic driving game OutRun. Photo by me: Banyalbufar, Majorca Edited with Photoshop and Camera Raw. Sprites by www.spriters-resource.com/gene… Characters belong to SEGA. ¡Hola de nuevo! He estado ocupado con mi nuevo documental, "Memorias: más allá del juego" (www.youtube.com/playlist?list=… pero aquí estoy de nuevo con otro Real Bits. Esta vez, con el clásico de conducción OutRun. Foto por mí: Banyalbufar, Mallorca. Editada con Photoshop y Camera Raw. Sprites por www.spriters-resource.com/gene… Los personajes pertenecen a SEGA.